Iowa has been picked to repeat in the Big Ten West, but it certainly won't be easy. CHICAGO — The attention is coming fast for the Iowa football team. That was the message coming from Session 1 here at Big Ten Media Days inside the Hyatt Regency McCormick Place. And how the Hawkeyes handle being the hunted, rather than the hunters, will determine whether they repeat as Big Ten West Division champions. Media members (well, 32 of 39 who voted in a Cleveland.com poll) think Iowa will handle it well. I was one of the seven who voted against Iowa. Not because I think there’s another clearly superior team in the West, but because motivation is a powerful force. Even 2015 Ohio State, which would have 11 players taken in the first 102 picks of the NFL Draft, couldn’t repeat in the Big Ten East. Understand this: The Hawkeyes will get everyone’s best shot. Remember a year ago, when Iowa went on its revenge tour? Iowa went 4-0 in rivalry trophy games, avenging an ugly 0-4 the previous year (including a 51-14 loss at Minnesota). Northwestern — a 10-win team a year ago — wants Iowa. Badly. The Hawkeyes have outscored Pat Fitzgerald’s boys 88-17 over the past two seasons. You know how Fitz feels about Iowa to begin with. This year’s game is Oct. 1 — Iowa’s homecoming. Walker remembers who spoiled Northwestern’s a year ago. Minnesota was picked fifth but returns a solid defense and fifth-year senior quarterback in Mitch Leidner. Leidner wouldn’t go that far, but he wanted to be a Hawkeye. But Iowa didn’t offer him a scholarship, so the native of Lakeville, Minn., stayed closer to home. Mitch Leidner wanted to be a Hawkeye. All he’s done in two starts against Iowa is roll up 86 points with five touchdown passes and no interceptions. This year’s game is Oct. 8 — a week after Northwestern — in Minneapolis. That'll be a tough spot for Iowa. Nebraska wasn’t here Monday as originally scheduled following the tragic death of punter Sam Foltz, but you can bet the Cornhuskers, tabbed second in the West in the media poll, want payback after last year’s 28-20 loss to the Hawkeyes in Lincoln. Wisconsin, another perennial division contender, will meet the press on Tuesday and probably talk about letting one get away against Iowa in last year's Big Ten opener. But Tuesday's primary media spotlight among West teams will be focused on the Hawkeyes. Claeys is right. Everything is there for Iowa. But we know how that turned out in 2005 and 2010. 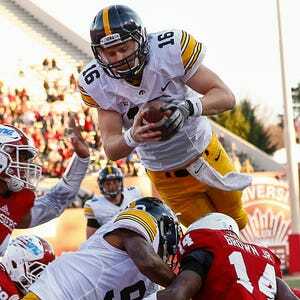 The Hawkeyes will never again simultaneously return an all-Big Ten quarterback (C.J. Beathard) and a Jim Thorpe Award-winning cornerback (Desmond King). Their schedule is a little tougher than a year ago, but manageable. There’s no clearly great team in their division. But the signal was sent Monday: Repeating is a tough thing to do when your school name has been highlighted on everyone else's schedule for months. So do the Hawkeyes. Every week.